Dashboard widgets configured to limit results via the Date Range feature will not limit results. Open the saved or custom query from the widget options. Add a comparison clause for the desired date field, e.g. 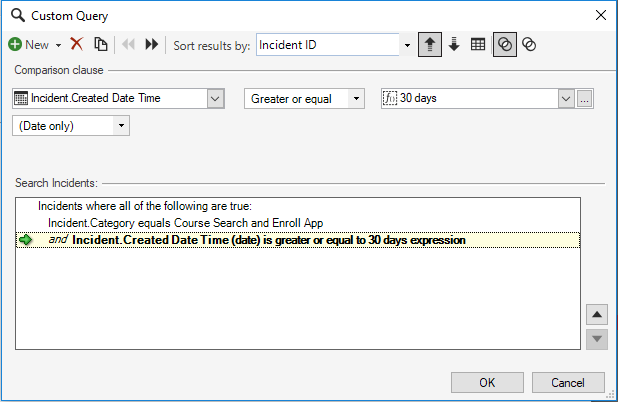 "Incident.Created Date Time" is greater or equal to "30 days expression" will return results within the last 30 days. For more information on working with search clauses, see WiscIT - Building Searches. Set the Date Range feature to "User Selectable"
Switching the date range from a single range to "User Selectable" (with one or more ranges) will cause the widget to only show results from within the selected date range (it will also allow users to change the specified date range, which may or may not be desired for a given widget). Cherwell has acknowledged this as a known issue that will be addressed in a future release. In the meantime, please use a workaround outlined above.